Administer and amend the Australian Rules of Racing and the Rules of the Australian Stud Book in adherence to worldâ€™s best practice standards of integrity and animal welfare. Foster strong working relationships at political and departmental levels, including participation in government/industry partnerships, ensuring that the Commonwealth and State Governments are at all times aware of the views and objectives of the Australian Thoroughbred Racing Industry. Maintain and build upon effective lines of consultation and communication which will inform industry stakeholders and customers of Racing Australiaâ€™s aims and objectives. Promote a better understanding, knowledge and media coverage of Thoroughbred racing as a local, regional and national industry and sport. Build on Racing Australia's position as a globallyrecognised influencer and standard setter of Thoroughbred Racing with the capacity to promote Australia's interests internationally. Racing never stops and neither does Racing Australia. The Service Centre is open seven days a week and other specialist services operate whenever racing is taking place. Racing Australia's support services are available 24/7, 365 days. Racing Australia's website provides access and the ability to transact specific industry functions at any time. With established products and services and a team of committed people, Racing Australia is Australia's leading provider of innovative low cost services to the Racing Industry. Importantly, Racing Australia commercialises the industry's racing materials on a national basis, through the sale of a variety of products and services such as Fields, Form and Results to a diverse range of print and digital publishers domestically and internationally. Racing Australia continues to develop and expand the number of integrated products and services available to Principal Racing Authorities, race clubs, owners, breeders, trainers, jockeys, punters and racing enthusiasts. The Australian Stud Book is the official record and publication of Thoroughbred bloodlines for horses born in Australia. Its core responsibility is the maintenance, accuracy, quality and integrity of these records. The Australian Stud Book operates under the Rules of the Australian Stud Book and the Australian Rules of Racing and International Stud Book Rules. The Registrar of Racehorses maintains the official register of ownership and naming of Thoroughbred racehorses for racing in Australia and for export. The Registrar of Racehorses operates under the Australian Rules of Racing. Via a 1800 service available seven days a week or via the online alternative Stable Assist, Racing Australia is the official entity which in conjunction with PRAs compiles, distributes and publishes Race Fields, for all States and Territories (except WA). Via these services trainers lodge; nominations, acceptances, scratchings and stable returns, operating under the Australian Rules of Racing. Maintenance of the official race results database for all States and Territories as well as the past performance (Form) database which Racing Australia distributes and publishes. Creation and publication of unique Form Comments for all TAB Race Meetings across Australia to be used in conjunction with Racing Australia Fields and Form products. High-functionality, web-based messaging service providing a low-cost communications system for the Thoroughbred industry via SMS, email, voice and fax. Messages can be formatted in keeping with the user's existing communications branding. The system can be fully self-service or Racing Australia can send messages on the user's behalf. Racing Australia racebooks engage both the casual and regular racegoer and are created with the intention of stimulating interest in racing and turnover. Racing Australia offers a range of innovative options and can prepare customisable racebooks to suit individual race club's needs combining the strength of pre-press tools and extensive experience. The on-course racebook can also be complemented by an online flip book version. 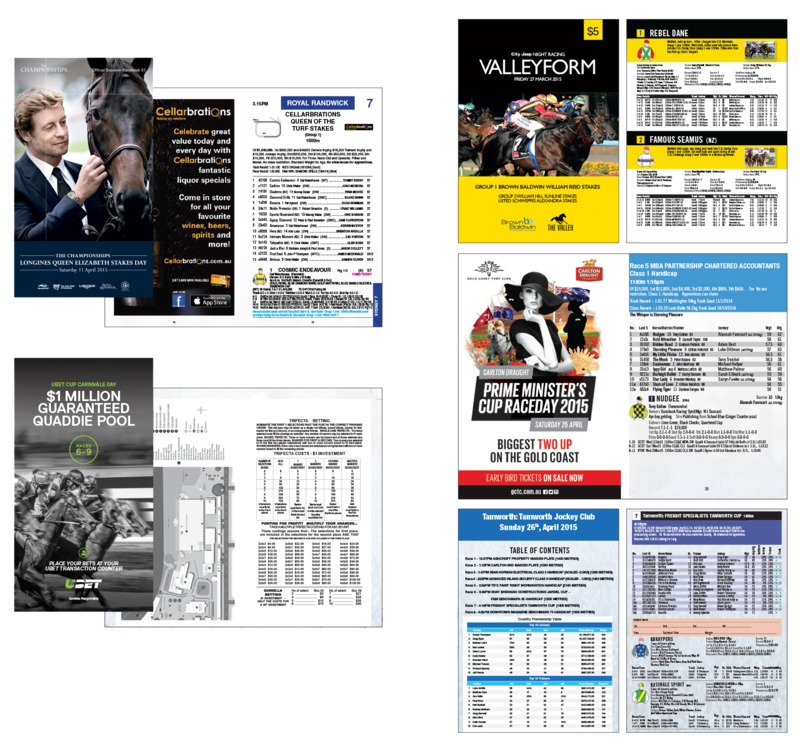 With full design capabilities Racing Australia has assisted many in the industry with the design of other print products such as breeding booklets, catalogues, flyers, business cards and promotional banners. 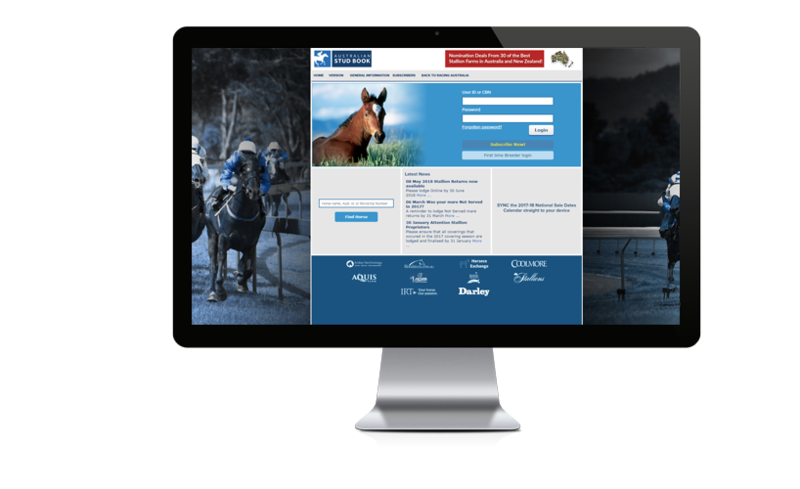 Racing Australia has extensive experience in developing and hosting full websites for clients such as race clubs and racing carnivals. 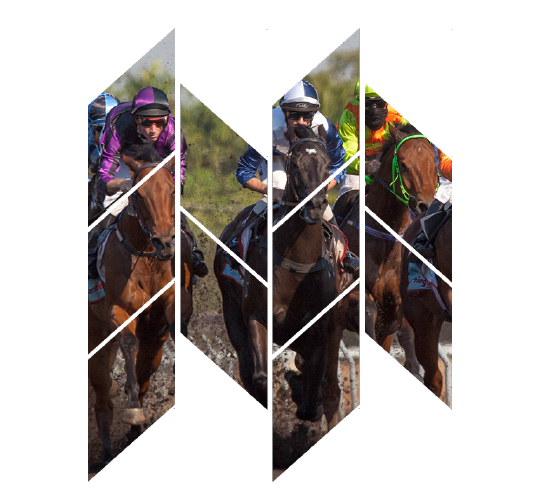 Where a client has an existing website but is looking to integrate enhanced Racing Materials (such as Fields, Form, Results), Racing Australia offers an iFrame solution which is used by a number of Principal Racing Authorities, race clubs, trainers and industry associations. Leveraging on this experience, Racing Australia also builds and hosts a number of specialist mobile sites for Principal Racing Authorities and race clubs. In a significant milestone for the Thoroughbred Racing Industry, Racing Australia has developed a unified Single National System following the ratification and agreement by all of RISA's shareholders, the Principal Racing Authorities (PRAs). 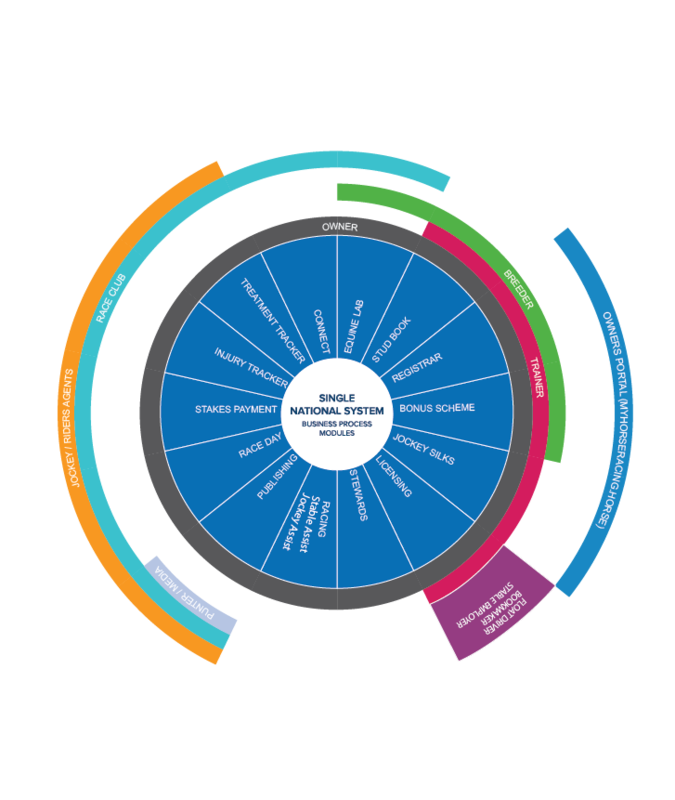 The Single National System (SNS) heralds an unparalleled and unique opportunity for the industry to consolidate its many core technology platforms into one system. The SNS is already creating opportunities for greater efficiencies, removal of duplications in infrastructure in each State and Territory and substantive benefits for industry participants in many of their core interactions including but not limited to licensing, ownership/horse registration, stakes payments and bonus scheme administration. Stewards and Handicappers along with Racing Departments are amongst key industry stakeholders who will also benefit from access to the SNS. Importantly, the SNS is not about changing who performs the business process, but rather about providing a set of unified tools. Racing Australia is the sole member of the Thoroughbred Trainers Service Centre Limited (TTSC) (ACN 112 056 032). The TTSC holds an ASIC issued Australian Financial Services Licence (AFSL No. 288-213). The service assists trainers, breeders and prospective Syndication companies comply with all of ASIC's obligations when shares are listed for sale in thoroughbreds to the public. RISA purchased the TTSC in 2007 and when RISA was renamed Racing Australia in April 2015 the ownership of the TTSC was retained. Racingjobs.com.au is a web-based platform that allows employers within the racing industry to advertise positions free of charge, or via a premium paid service. The main aim of Racingjobs.com.au is to promote, encourage and strengthen employment within the racing industry and to assist both industry employers and job seekers. Racingjobs.com.au is owned and operated by Racing Australia. Racing Australia (RA) is the national industry body representing Thoroughbred racing in Australia. In 2015, Racing Australia purchased the Australian Stud Book (ASB) from the Australian Turf Club and the Victoria Racing Club. The Australian Stud Book records the official bloodlines for all Thoroughbreds born and raced in Australia. As part of the acquisition of the Stud Book, Racing Australia decided to bring all its operations under their own banner, and thus, the Equine Genetics Research Centre was born. In 2017, Dr Natasha Hamilton, an equine geneticist, was recruited from the University of Sydney to head the new laboratory. Soon after, Dominique Dolgener agreed to become the manager. Recent Bachelor of Science graduates Taelor Mackenzie and Emalyn Batley make up the team as Technical Officers. This team combines specialities in equine research and excellent technical laboratory skills with a passion for horses. The laboratory was officially opened on April 23rd, 2018 by Russell Balding AO (Deputy Chair Racing Australia) and John Messara AM (Former Chair Racing Australia).